Designed from the ground-up to provide a striking balance between high-performance gaming and simultaneous streaming, AMD’s Ryzen series of processors have proven to be multi-tasking monsters. Built on the 14nm ZEN architecture for the newly launched AM4 CPU socket, temperatures, power-efficiency and CPU clock-speed scaling has also seen a drastic redesign within the management towards optimal performance for the desired workload. As well as bringing support for the DDR4 memory interface – albeit within a dual-channel configuration, it would seem the many years of waiting would prove to be a worthy upgrade for those coming from prior generation products such as the FX-4300 or FX-6300. The drop in power consumption alone compared to the previous high-end processors like the FX-8350 – or better yet the FX-9590 – would prove to be a justified saving in energy bills alone. So where exactly do the differences reside within AMD’s latest Ryzen processors? Support for modern technologies and increased power-efficiency is already great, but how about specifications and performance, you may ask. Well, AMD has divided the performance characteristics of each class of Ryzen processor into three distinct groups: Ryzen 3, Ryzen 5 and Ryzen 7. While each tier of CPU features the same 14nm architecture as well as the exact same feature-set, the most noticeable differences come in the form of core count and CPU frequency. 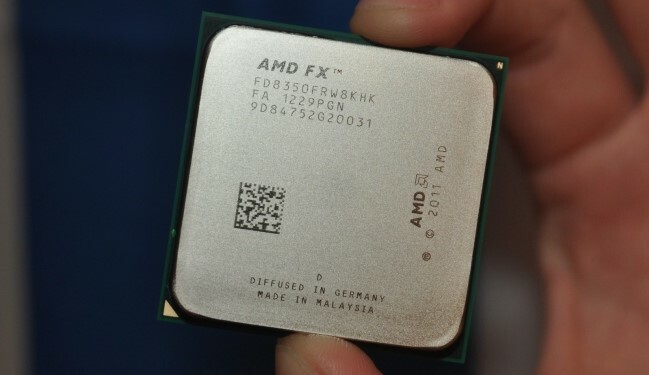 Where the embedded feature-set of AMD’s Pure Power, Precision Boost, and Extended Frequency Range (XFR) all assist the user in achieving in top-tier performance through the means of automated and manual overclocking – prioritizing efficiency and temperatures as frequencies increase, as to how far each individual CPU can be pushed will be dependent upon the cooling solution and the base clock speeds that each CPU presents. As a perfect starting point for entry-level gamers, baby’s first steps consists of two processors: Ryzen 1200 and 1300X. Featuring four cores at ranging from 3.1GHz to 3.7GHz, Ryzen 3 as with all Ryzen series processors feature an unlocked core design, meaning they’re perfect for overclocking should gamers seek extra performance. With a great starting price around £110, Ryzen 3 processors have been built to compete with Intel’s Pentium and Core-i3 Kaby Lake processors which feature dual-core, hyper-threaded designs. Taking the performance lead by a noticeable margin primarily within multi-threaded applications, further optimizations remain to be seen as to how much further performance can go. What will be interesting to see is how Ryzen 3 stacks up against Intel’s lower-tier Core-i5 processors. As these CPUs feature true quad-core designs – unlike the i3, core for core performance should be on equal grounds as to whether or not the additional pricing of the Core-i5 series can be justified. Where single-core performance favours the mature and refined IPC of Intel’s advancements in CPU frequency, their dual-core design holds no place in the modern world. Let’s face it, with more and more games refusing to actually launch if less than four-cores are detected on the user’s system, is the price of Intel’s entry-level models actually worth it? As long as gamers are given the choice for dual-core processors, the less the games themselves will actually progress in regards to utilizing multi-core processors. Catering to the bottom of the barrel will always result in compromises. If you haven’t guessed already, I, for one am pleased to see AMD set a new standard for base core quantity on the entry-level processors. The death of the dual-core is one I have been anticipating for the longest. Reserved seats at the funeral with a smile on my face as the dual-core irrelevancy of this archaic design goes down in history. Consisting of four different processors Ryzen 5 features a quad-core, multi-threaded design as the minimum – paired with a 3.2GHz base frequency – boosting to 3.4GHz when called upon by an application. Aimed to compete with Intel’s Core i5 Kaby Lake processors, Ryzen 5 matches performance – at the minimum – often exceeding it within multi-tasking applications. Where the Core i5 CPUs feature a quad-core design, the Ryzen 5’s multithreaded core count provides a great advantage which will be great for the long-term. It should be noted however that within single-threaded applications (those which emphasize raw clock-speed on a single-core) Ryzen 5 does fall behind. And despite the multithreaded nature of the processor which equates to what is essentially an Eight-Core part, Ryzen’s efficiency on a per-core basis is one that remains to be questioned. Sounds as though the CPU is brute-forcing its way through performance as opposed to actual core efficiency. However, since Ryzen 5 is still fairly new, this leaves the doors open for further developments and optimization on behalf of game developers and programmers – something which has been mentioned by AMD during Ryzen’s initial launch. 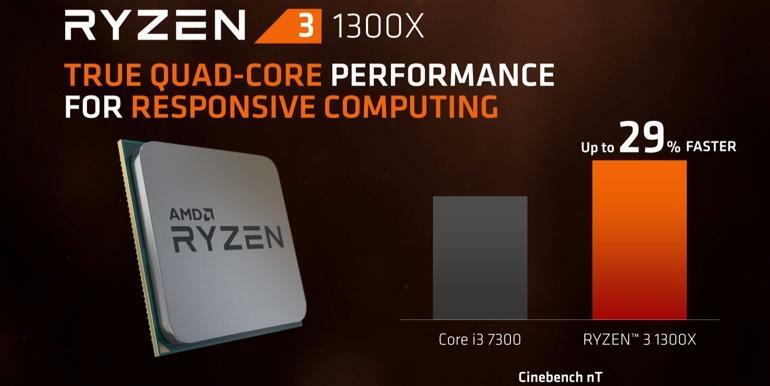 Where two of the four processors within this group are quad-core, multi-threaded parts – Ryzen 5 1400 and 1500X, the Ryzen 5 1600 and 1600X feature six-core multi-threaded designs. Naturally, this sees an increase to the TDP on the upper-tier 1600X, while clock-speeds remain to be something of a mixed bag entirely. While CPU overclocking can be achieved a singular basis going by the core, synchronization across all cores is also an option – leaving the CPU to regulate its frequency to an optimal state, aiming for maximum performance when viable. Hovering around 3.2GHz to 3.6GHz across the entire line-up, hitting 3.7GHz to 4.0GHz should be achievable given the boost speeds listed by AMD. Sitting at the top of AMD’s Ryzen products resides the 1700, 1700X and the 1800X. Featuring a bare minimum of eight-cores and sixteen threads, Ryzen 7’s 3GHz to 4GHz clock speeds have been designed to go head-to-head with Intel’s Core-i7 Kaby Lake processors. Much like the Ryzen 5 processors, Ryzen 7 tends to excel within multi-threaded applications. Where single-core performance and gaming is concerned, Ryzen 7 is also a mixed bag of results. Often trading blows with the Core i7-7700K as well as various other CPUs such as the i7-6800K and i7-5960X, Ryzen’s advantage is clearly down to its price. At less than half the price of every Intel competitor whether that be on the Kaby Lake, Broadwell-E or Skylake platform, Ryzen’s lead is certainly one that will appease AMD as much as it will gamers. For those who work within video editing software or rely on multi-tasking as part of their day-to-day usage, Ryzen 7 is without a doubt the go to series of processors where value is concerned. As previously mentioned, AMD Ryzen’s overclocking potential has been designed on a scalable basis relating to performance headroom, applications in-question and thermal limitations. It’s because of these reasons why AMD has decided to improve the traditional appearance and capabilities of the bundled-in stock cooler – going for a stylish and visually appealing look that works well with any system build. Available in three different models, appropriately bundled with the performance to match each CPU,. Bundled with the Ryzen 3 and the Ryzen 5 1400 processors, the first cooler in AMD’s line-up is the Wraith Stealth. This goes well with the 65W TDP of the processors and has been constructed to deliver quiet operation while enabling high-performance. 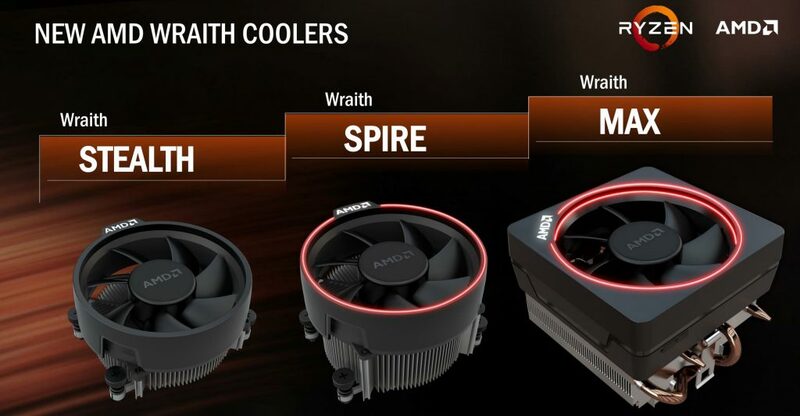 For those looking to purchase a Ryzen 5 1500, 1600, 1600X or 1700, the Wraith Spire features a larger heatsink with additional styling, keeping temperatures under control at 95W TDP. At the top of the deck sits the Wraith Max. This cooler has been framed to support the Ryzen 7 1700X and 1800X with its larger build and heat-pipe design. Without a doubt, AMD’s Wraith coolers are quite appealing. While I personally would rather opt for an aftermarket cooler more in-line with my own personal preferences of style, tolerance and performance, those without any other choice should be pleased with what AMD has to offer. Previous Post:Cooler Master MasterKeys Lite L: Is It Worthy?